Come back one of the mods that have more variety of new objects and items added to your Minecraft. 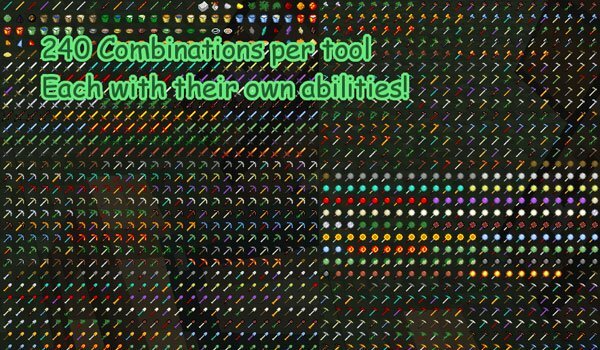 Inficraft 1.4.7 adds many things, for instance I will say that for each tool or weapon, the mod adds up to 240 possible incredible combinations. Most of these weapons or tools also have powders or special functions. To make that we’ll find out new resources that will serve to create them. Since the last update of this mod, has changed in one feature, the author made other mods and we could say that combines all these mods in a pack, so this new InfiCraft have an infinity of new things, beyond other objects it had before updating. How to install InfiCraft Mod for Minecraft 1.4.7? Paste the files inside the mod downloaded into your .minecraft / mods. We already have plenty of new things in Minecraft!